Almost 60 Clonliffe athletes competed in the Raheny 5 mile in Raheny Village this afternoon. Great compliments must go to the organisers for putting on a top class event with a huge field of over 4000 athletes led home by Mick Clohisey of the host club in 23.26. 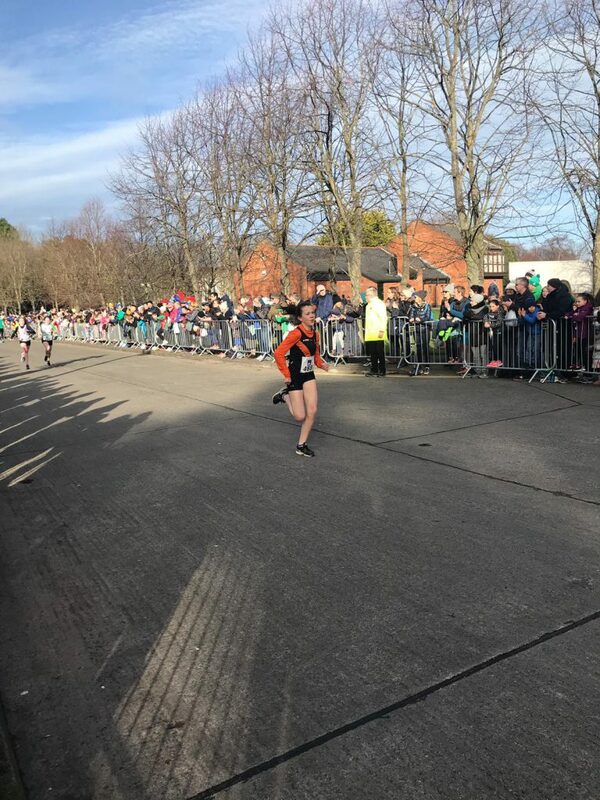 First of the black and amber was Ian Guiden in a time of 24.21 to take 7th place with Cathal Doyle next in (24.39) for 12 place both running pbs Sean Doran 29th in 25.47 (looks like that is also a PB) and Robert Reid in 28.55 to finish 3rd M50. First of the Clonliffe ladies was Maura Matthews 32.07. 7 Ian GUIDEN 00:24:21 00:24:21 2887 M (7) MS (7) Clonliffe Harriers A.C.
12 Cathal DOYLE 00:24:39 00:24:39 3028 M (12) MS (12) Clonliffe Harriers A.C.
29 Sean DORAN 00:25:47 00:25:47 2224 M (29) MS (28) Clonliffe Harriers A.C.
149 Robert REID 00:28:55 00:28:59 1938 M (139) M50 (3) Clonliffe Harriers A.C.
192 Michael CASSIDY 00:29:36 00:29:41 399 M (181) MS (126) Clonliffe Harriers A.C.
196 Eoghan MURPHY 00:29:18 00:29:48 1175 M (184) MS (128) Clonliffe Harriers A.C.
196 David MULLEN 00:29:18 00:29:48 1923 M (185) MS (129) Clonliffe Harriers A.C.
214 Matt MCGUINNESS 00:29:49 00:30:09 406 M (197) MS (134) Clonliffe Harriers A.C.
234 Wayne WALKER 00:30:07 00:30:26 2334 M (216) MS (147) Clonliffe Harriers A.C.
238 Conor DELANEY 00:30:23 00:30:29 710 M (218) M45 (27) Clonliffe Harriers A.C.
258 Shane CASEY 00:30:29 00:30:41 2805 M (235) M40 (43) Clonliffe Harriers A.C.
271 Anthony DORAN 00:30:38 00:30:55 1455 M (247) MS (163) Clonliffe Harriers A.C.
280 Stephen TRACEY 00:30:47 00:31:01 1716 M (256) M40 (46) Clonliffe Harriers A.C.
293 Alex EUSTACE 00:30:57 00:31:11 1929 M (267) M40 (49) Clonliffe Harriers A.C.
332 Peter BISSETT 00:31:24 00:31:41 1449 M (301) MS (193) Clonliffe Harriers A.C.
374 Kevin DOWLING 00:31:37 00:32:07 1123 M (335) M50 (15) Clonliffe Harriers A.C.
384 Tom GRIFFIN 00:32:10 00:32:13 3545 M (344) M45 (38) Clonliffe Harriers A.C.
399 Maura MATTHEWS 00:32:07 00:32:21 1481 F (43) F40 (10) Clonliffe Harriers A.C.
459 Alan TOWNSEND 00:32:36 00:32:58 2397 M (412) M45 (53) Clonliffe Harriers A.C.
461 Alan WORRALL 00:32:43 00:33:01 2017 M (414) M45 (54) Clonliffe Harriers A.C.
484 Alan CURLEY 00:32:41 00:33:13 2365 M (436) M40 (94) Clonliffe Harriers A.C.
521 Rachel EUSTACE 00:33:21 00:33:36 1930 F (56) FS (34) Clonliffe Harriers A.C.
552 Aideen BRADY 00:33:39 00:33:54 1667 F (59) FS (37) Clonliffe Harriers A.C.
558 Noel O’DWYER 00:33:26 00:33:55 1093 M (499) M45 (68) Clonliffe Harriers A.C.
601 Mick GLEESON 00:34:01 00:34:21 1233 M (536) M45 (76) Clonliffe Harriers A.C.
602 Laura KERNAN 00:34:02 00:34:21 1308 F (66) F40 (18) Clonliffe Harriers A.C.
602 Declan GRANT 00:34:01 00:34:21 1234 M (538) M50 (36) Clonliffe Harriers A.C.
606 Shane ROONEY 00:34:09 00:34:23 1453 M (539) M40 (107) Clonliffe Harriers A.C.
611 Murray AHERN 00:34:09 00:34:24 1411 M (543) M40 (109) Clonliffe Harriers A.C.
654 Ciara PEELO 00:34:01 00:34:57 1049 F (78) FS (47) Clonliffe Harriers A.C.
698 Stephen DOYLE 00:34:55 00:35:17 2797 M (608) MS (324) Clonliffe Harriers A.C.
713 Declan MURRAY 00:34:40 00:35:27 843 M (618) M60 (6) Clonliffe Harriers A.C.
721 Clodagh MORIARTY 00:35:15 00:35:32 1622 F (96) F40 (26) Clonliffe Harriers A.C.
726 Stephen BATESON 00:34:40 00:35:33 3304 M (630) M45 (93) Clonliffe Harriers A.C.
791 Kevin SHEEHY 00:35:46 00:36:06 4090 M (685) M50 (50) Clonliffe Harriers A.C.
969 Yvonne MCDONOUGH 00:37:25 00:37:43 334 F (159) F40 (44) Clonliffe Harriers A.C.
978 Aine MCCANN 00:36:32 00:37:49 1599 F (162) F50 (14) Clonliffe Harriers A.C.
983 Emma COOPER 00:36:28 00:37:52 3522 F (163) F40 (45) Clonliffe Harriers A.C.
987 Kerri PAGE 00:36:55 00:37:53 1636 F (164) FS (78) Clonliffe Harriers A.C.
1058 Orla DEIGHAN 00:37:55 00:38:22 1251 F (184) F45 (25) Clonliffe Harriers A.C.
1069 Elaine O’DOWD 00:37:32 00:38:26 1107 F (187) F45 (26) Clonliffe Harriers A.C.
1100 Sinéad AHERN 00:38:28 00:38:42 2036 F (195) FS (92) Clonliffe Harriers A.C.
1122 Siobhan MCCARTHY 00:38:14 00:38:51 3144 F (204) F45 (30) Clonliffe Harriers A.C.
1157 Paula HORGAN 00:38:24 00:39:03 167 F (214) FS (101) Clonliffe Harriers A.C.
1170 Emer BRENNAN 00:37:33 00:39:07 737 F (220) FS (105) Clonliffe Harriers A.C.
1247 Brid BEAUSANG 00:39:20 00:39:42 1652 F (243) F40 (59) Clonliffe Harriers A.C.
1328 Caoimhe RYAN 00:38:40 00:40:15 3418 F (277) FS (131) Clonliffe Harriers A.C.
1334 Karen MCAFFEE 00:38:41 00:40:16 162 F (280) FS (132) Clonliffe Harriers A.C.
1374 Patrick DEVITT 00:39:49 00:40:30 744 M (1078) M65 (6) Clonliffe Harriers A.C.
1411 Nollaig DONOHOE 00:40:03 00:40:42 426 F (311) FS (147) Clonliffe Harriers A.C.
1562 Laura MCAFFEE 00:40:08 00:41:43 3776 F (379) FS (177) Clonliffe Harriers A.C.
1592 Mandy MCMENAMY 00:40:17 00:41:52 1450 F (388) F45 (64) Clonliffe Harriers A.C.
1656 Evelyn BRENNAN 00:41:58 00:42:20 1470 F (415) F50 (34) Clonliffe Harriers A.C.
1693 Rhona SHEEAN 00:42:10 00:42:32 1454 F (434) F45 (73) Clonliffe Harriers A.C.
1788 Janette REID 00:41:30 00:43:06 1999 F (478) F45 (81) Clonliffe Harriers A.C.
3642 Colm LEONARD 00:59:28 00:59:28 52 M (2001) M50 (193) Clonliffe Harriers A.C.
3858 Fergus KEENAN 01:16:01 01:16:01 3502 M (2038) M40 (434) Clonliffe Harriers A.C. In advance of the 5 mile there were a number of juvenile races. 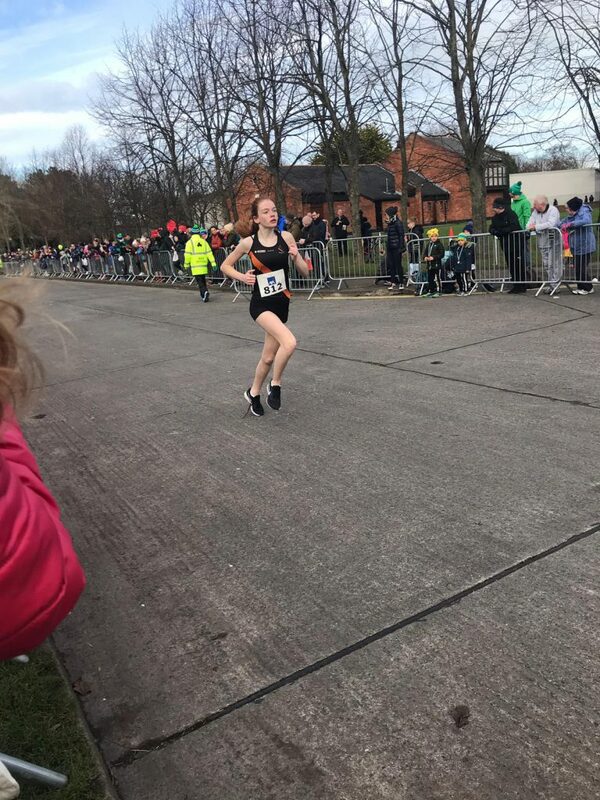 Clonliffe`s Sorcha O`Connor was a run away winner of the girls U/12 race and in the U/16 race Amy Sheehy was 5th girl.